David Cobb lets fly for Peterborough Sports during their comfortable win over Peterborough Northern Star. 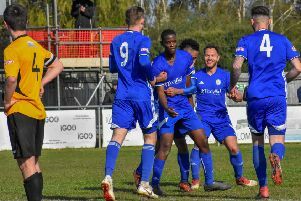 Peterborough Sports manager Jimmy Dean is thrilled to have secured the city’s United Counties League bragging rights for the season. Sports ran out comfortable 3-0 winners over Peterborough Northern Star in the eagerly-anticipated second round League Cup tie on Tuesday. Two penalties from Lewis Webb and a 10-yard strike from former Star teenager Jordan Macleod emphasised the gulf in quality between the sides, even though Sports play a division below their rivals. That won’t be the case next season as Sports are running away with the First Division. On the evidence of one cup tie they already seem to possess a squad capable of challenging for the Premier Division crown. Star are seventh in the top flight. That Sports’ squad improved this week following the return of high-class young forward Dan Clements to the club from higher-level Stamford AFC. Dean said: “We have been building towards next season as well as for this season and my chairman (Tommy Cooper) has backed me 100 per cent all season. The game against Star was an important one for us because they are better opposition than we have been playing, but we still won comfortably. “We could have won by six or seven in the end, but I’m glad we didn’t as that would have been harsh on them. “They were perhaps set up a bit negatively though. They get everyone behind the ball as quickly as they can which limited their abilityto hurt us going forward. They hit the bar twice, but both were speculative efforts. Sports’ scheduled Division One game at Long Buckby this Saturday has been postponed because of the home side’s cup commitments, but Sports have a tasty-looking clash at home to fourth-placed Potton next Tuesday (December 8). Star defender Chris Hassan conceded both spot-kicks and was shown a straight red card for the second one for a foul on Avelino Vieira. Hayden Bream was the Star man to strike the crossbar twice. Their goalkeeper Dan George made two outstanding late saves to keep it at 3-0. Star should return to winning ways this Saturday as they travel to Premier Division whipping boys Huntingdon United. Stewart & Lloyds, the team second in Division One, host Peterborough Premier Division side Netherton in a Northants Junior Cup tie on Saturday. The match was postponed last weekend because of a waterlogged pitch.